The latest reviewed version was checked on 4 November 2017. There is 1 pending change awaiting review. The primary function of blood is to supply oxygen and nutrients as well as constitutional elements to tissues and to remove waste products. Blood also enables hormones and other substances to be transported between tissues and organs. Problems with blood composition or circulation can lead to downstream tissue malfunction. Blood is also involved in maintaining homeostasis by acting as a medium for transferring heat to the skin and by acting as a buffer system for bodily pH. The blood is circulated through the lungs and body by the pumping action of the heart. The right ventricle pressurizes the blood to send it through the capillaries of the lungs, while the left ventricle re-pressurizes the blood to send it throughout the body. Pressure is essentially lost in the capillaries, hence gravity and especially the actions of skeletal muscles are needed to return the blood to the heart. Blood circulation from the heart to the lungs. Oxygen (O2) is the most immediate need of every cell and is carried throughout the body by the blood circulation. Oxygen is used at the cellular level as the final electron acceptor in the electron transport chain (the primary method of generating ATP for cellular reactions). Oxygen is carried in the blood bound to hemoglobin molecules within red blood cells. 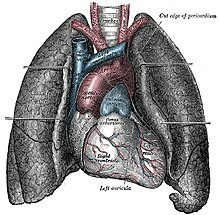 Hemoglobin binds oxygen when passing through the alveoli of the lungs and releases oxygen in the warmer, more acidic environment of bodily tissues, via simple diffusion. Carbon dioxide (CO2) is removed from tissues by blood and released into the air via the lungs. Carbon dioxide is produced by cells as they undergo the processes of cellular respiration (particularly the Kreb's Cycle). The molecules are produced from carbons that were originally part of glucose. Most of the carbon dioxide combines with water and is carried in the plasma as bicarbonate ions. An excess of carbon dioxide (through exercise, or from holding ones breath) quickly shifts the blood pH to being more acidic (acidosis). Chemoreceptors in the brain and major blood vessels detect this shift and stimulate the breathing center of the brain (the medulla oblongata). Hence, as CO2 levels build up and the blood becomes more acidic, we involuntarily breathe faster, thus lowering CO2 levels and stabilizing blood pH. In contrast, a person who is hyperventilating (such as during a panic attack) will expire more CO2 than being produced in the body and the blood will become too alkaline (alkalosis). Blood is a circulating tissue composed of fluid plasma and cells (red blood cells, white blood cells, platelets). Anatomically, blood is considered a connective tissue, due to its origin in the bones and its function. Blood is the means and transport system of the body used in carrying elements (e.g. nutrition, waste, heat) from one location in the body to another, by way of blood vessels. Plasma which makes up 55% of blood volume. Formed cellular elements (red and white blood cells, and platelets) which combine to make the remaining 45% of blood volume. Plasma is made up of 90% water, 7-8% soluble proteins (albumin maintains bloods osmotic integrity, others clot, etc), 1% carbon-dioxide, and 1% elements in transit. One percent of the plasma is salt, which helps with the pH of the blood. The largest group of solutes in plasma contains three important proteins to be discussed. There are: albumins, globulins, and clotting proteins. Albumins are the most common group of proteins in plasma and consist of nearly two-thirds of them (60-80%). They are produced in the liver. The main function of albumins is to maintain the osmotic balance between the blood and tissue fluids and is called colloid osmotic pressure. In addition, albumins assist in transport of different materials, such as vitamins and certain molecules and drugs (e.g. bilirubin, fatty acids, and penicillin). Globulins are a diverse group of proteins, designated into three groups: gamma, alpha, and beta. Their main function is to transport various substances in the blood. Gamma globulins assist the body's immune system in defense against infections and illness. Plasma also carries Respiratory gases; CO2 in large amounts(about 97%) and O2 in small amounts(about 3%), various nutrients(glucose, fats), wastes of metabolic exchange(urea, ammonia), hormones, and vitamins. Picture of red blood cells. Red blood cell (erythrocyte) also known as "RBCs". RBCs are formed in the myeloid tissue or most commonly known as red bone marrow, although when the body is under severe conditions the yellow bone marrow, which is also in the fatty places of the marrow in the body will also make RBCs. The formation of RBCs is called erythropoiesis ( erythro / red; poiesis / formation). Red blood cells lose nuclei upon maturation, and take on a biconcave, dimpled, shape. They are about 7-8 micrometers in diameter. There are about 1000x more red blood cells than white blood cells. RBCs live about 120 days and do not self repair. RBCs contain hemoglobin which transports oxygen from the lungs to the rest of the body, such as to the muscles, where it releases the oxygen load.The hemoglobin gets its red color from their respiratory pigments. RBCS have a shape of a disk that appears to be “caved in” or almost flattened in the middle; this is called bi-concave. This bi-concave shape allows the RBC to carry oxygen and pass through even the smallest capillaries in the lungs. This shape also allows RBCs to stack like dinner plates and bend as they flow smoothly through the narrow blood vessels in the body. RBCs lack a nucleus (no DNA) and no organelles, meaning that these cells cannot divide or replicate themselves like the cells in our skin and muscles. RBCs have a short life span of about 120 days, however, as long as our myeloid tissue is working correctly, we will produce about 2-3 million RBCs per second. That is about 200 billion a day! This allows us to have more to replace the ones we lose. The main component of the RBC is hemoglobin protein, of which there are about 250 million per cell. The word hemoglobin comes from "hemo" meaning blood and "globin" meaning protein. Hemoglobin is composed of four protein subunits: polypeptide globin chains that contain anywhere from 141 to 146 amino acids. Hemoglobin is responsible for the cell’s ability to transport oxygen and carbon dioxide. Hemoglobin, iron, and oxygen interact with each other, forming the RBCs' bright red color. You can call this interaction by product oxyhemoglobin. Carbon Monoxide binds with hemoglobin faster than oxygen, and stays bound for several hours, making hemoglobin temporarily unavailable for oxygen transport. One red blood cell contains about 200 million hemoglobin molecules. If all this hemoglobin was in the plasma rather than inside the cells, blood would be so "thick" that the heart would have a difficult time pumping it through. The thickness of blood is called viscosity. The greater the viscosity of blood, the more friction there is, and more pressure is needed to force blood through. The main function is the transportation of oxygen throughout the body and the ability of the blood to carry out carbon dioxide which is called carbamino – hemoglobin. Maintaining the balance of blood is important. The balance can be measured by the acid and base levels in the blood. This is called pH. Normal pH of blood ranges between 7.35-7.45; this normal blood is called Alkaline (less acidic then water). A drop in pH is called Acidic. This condition is also called Acidosis. A jump in pH higher then 7.45 is called "Alkalosis". To maintain the homeostasis (or balance,) the blood has tiny molecules within the RBC that help prevent drops or increases from happening. Red blood cells are broken down and hemoglobin is released. The globin part of the hemoglobin is broken down into amino acid components, which in turn are recycled by the body. The iron is recovered and returned to the bone marrow to be reused. The heme portion of the molecule experiences a chemical change and then gets excreted as bile pigment (bilirubin) by the liver. Heme portion after being broken down contributes to the color of feces and your skin color changing after being bruised. White blood cells are different from red cells in the fact that they are usually larger in size 10-14 micrometers in diameter. White blood cells do not contain hemoglobin which in turn makes them translucent. Many times in diagrams or pictures white blood cells are represented in a blue color, mainly because blue is the color of the stain used to see the cells. White blood cells also have nucleii, that are some what segmented and are surrounded by electrons inside the membrane. White blood cells (leukocytes) are also known as "WBC's". White blood cells are made in the bone marrow but they also divide in the blood and lymphatic systems. They are commonly amoeboid (cells that move or feed by means of temporary projections, called pseudopods (false feet), and escape the circulatory system through the capillary beds. The different types of WBC's are Basophils, Eosinophils, Neutrophils, Monocytes, B- and T-cell lymphocytes. Neutrophils, Eosinophils, and Basophils are all granular leukocytes. Lymphocytes and Monocytes are agranular leukocytes. Basophils store and synthesize histamine which is important in allergic reactions. They enter the tissues and become "mast cells" which help blood flow to injured tissues by the release of histamine. Eosinophils are chemotoxic and kill parasites. Neutrophils are the first to act when there is an infection and are also the most abundant white blood cells. Neutrophils fight bacteria and viruses by phagocytosis which mean they engulf pathogens that may cause infection. The life span of a of Neutrophil is only about 12-48 hours. Monocytes are the biggest of the white blood cells and are responsible for rallying the cells to defend the body. Monocytes carry out phagocytosis and are also called macrophages. Lymphocytes help with our immune response. There are two Lymphocytes: the B- and T- cell. B-Lymphocytes produce antibodies that find and mark pathogens for destruction. T-Lymphocytes kill anything that they deem abnormal to the body. WBCs are classified by phenotype which can be identified by looking at the WBCs under a microscope. The Granular phenotype are able to stain blue. The Agranular phenotype are able to stain red. Neutrophils make up 50-70% of Granular cells Eosinophils make up 2-4%, and Basophils 0-1%. Monocytes make up 2-8% of Agranular cells. B and T Lymphocytes make up 20-30%. As you can see, there is a great deal of differentiation between WBCs. These special cells help our bodies defend themselves against pathogens. Not only do they help our immune system but they remove toxins, wastes, and abnormal or damaged cells. Thus, we can say that WBCs' main function is being Phagocytic which means to engulf or swallow cells. A 250 ml bag of newly collected platelets. Platelets, also called thrombocytes, are membrane-bound cell fragments. Platelets have no nucleus, they are between one to two micrometers in diameter, and are about 1/10th to 1/20th as abundant as white blood cells. Less than 1% of whole blood consists of platelets. They result from fragmentation of large cells called Megakaryocytes - which are cells derived from stem cells in the bone marrow. Platelets are produced at a rate of 200 billion per day. Their production is regulated by the hormone called Thrombopoietin. The circulating life of a platelet is 8–10 days. The sticky surface of the platelets allow them to accumulate at the site of broken blood vessels to form a clot. This aids in the process of hemostasis ("blood stopping"). Platelets secrete factors that increase local platelet aggregation (e.g., Thromboxane A), enhance vasoconstriction (e.g., Serotonin), and promote blood coagulation (e.g., Thromboplastin). Hemostasis is the natural process of stopping blood flow or loss of blood following an injury. (hemo = blood; stasis = standing). It has three stages: (1) vascular spasm, vasoconstriction, or intense contraction of blood vessels, (2) formation of a platelet plug and (3) blood clotting or coagulation. Once the flow of blood has been stopped, tissue repair can begin. Vascular spasm or Vasoconsriction: In a normal individual, immediately after a blood vessel has been cut and endothelial cells are damaged, vasoconstriction occurs, thus slowing blood flow to the area. Smooth muscle in the vessel wall goes through spasms or intense contractions that constrict the vessel. If the vessels are small, spasms compress the inner walls together and may be able to stop the bleeding completely. If the vessels are medium to large-sized, the spasms slow down immediate outflow of blood, lessening the damage but still preparing the vessel for the later steps of hemostasis. These vascular spasms usually last for about 30 minutes, long enough for the next two stages of hemostasis to take place. Formation of a Platelet Plug: Within 20 seconds of an injury, coagulation is initiated. Contrary to popular belief, clotting of a cut on the skin is not initiated by air or drying out, but by platelets adhering to and activated by collagen in the blood vessels endothelium. The activated platelets then release the contents of their granules, which contain a variety of substances that stimulate further platelet activation and enhance the hemostatic process. When the lining of a blood vessel breaks and endothelial cells are damaged, revealing collagen proteins in the vessel wall, platelets swell, grow spiky extensions, and start clumping together. They start to stick to each other and the walls of the vessel. This continues as more platelets congregate and undergo these same transformations. This process results in a platelet plug that seals the injured area. If the injury is small, a platelet plug may be able to form and close it within several seconds. If the damage is more serious, the next step of blood clotting will take place. Platelets contain secretory granules. When they stick to the proteins in the vessel walls, they degranulate, thus releasing their products, which include ADP (adenosine diphosphate), serotonin, and thromboxane A2. A Blood Clot Forms: If the platelet plug is not enough to stop the bleeding, the third stage of hemostasis begins: the formation of a blood clot. First, blood changes from a liquid to a gel. At least 12 substances called clotting factors take part in a series of chemical reactions that eventually create a mesh of protein fibers within the blood. Each of the clotting factors has a very specific function. We will discuss just three of the substances here: prothrombin, thrombin, and fibrin. Prothrombin and fibrinogen are proteins that are produced and deposited in the blood by the liver. Prothrombin: When blood vessels are damaged, vessels and nearby platelets are stimulated to release a substance called prothrombin activator, which in turn activates the conversion of prothrombin, a plasma protein, into an enzyme called thrombin. This reaction requires calcium ions. Thrombin: Thrombin facilitates the conversion of a soluble plasma protein called fibrinogen into long insoluble fibers or threads of the protein fibrin. Fibrin: Fibrinogen is cleaved by thrombin to form its active form, "fibrin." Fibrin threads wind around the platelet plug at the damaged area of the blood vessel, forming an interlocking network of fibers and a framework for the clot. This net of fibers traps and helps hold platelets, blood cells and other molecules tight to the site of injury, functioning as the initial clot. This temporary fibrin clot can form in less than a minute, and usually does a good job of reducing the blood flow. Next, platelets in the clot begin to shrink, tightening the clot and drawing together the vessel walls. Usually, this whole process of clot formation and tightening takes less than a half hour. The use of adsorbent chemicals, such as zeolites, and other hemostatic agents, are also being explored for use in sealing severe injuries quickly. The ABO blood group is represented by substances on the surface of red blood cells (RBCs). These substances are important because they contain specific sequences of amino acid and carbohydrates which are antigenic. As well as being on the surface of RBCs, some of these antigens are also present on the cells of other tissues. A complete blood type describes the set of 29 substances on the surface of RBCs, and an individual's blood type is one of the many possible combinations of blood group antigens. Usually only the ABO blood group system and the presence or absence of the Rhesus D antigen (also known as the Rhesus factor or RH factor) are determined and used to describe the blood type. Over 400 different blood group antigens have been found, many of these being very rare. If an individual is exposed to a blood group antigen that is not recognized as self, the individual can become sensitized to that antigen; the immune system makes specific antibodies which binds specifically to a particular blood group antigen and an immunological memory against that particular antigen is formed. These antibodies can bind to antigens on the surface of transfused red blood cells (or other tissue cells) often leading to destruction of the cells by recruitment of other components of the immune system. Knowledge of a individual's blood type is important to identify appropriate blood for transfusion or tissue for organ transplantation. Several different RBC surface antigens stemming from one allele (or very closely linked genes) are collectively labeled as a blood group system (or blood group). The two most important blood group systems were discovered during early experiments with blood transfusion, the ABO group in 1901 and the Rhesus group in 1937 . These two blood groups are reflected in the common nomenclature A positive, O negative, etc. with letters referring to the ABO group and positive/negative to the presence/absence of the RhD antigen of the Rhesus group. Development of the Coombs test in 1945 and the advent of transfusion medicine led to discovery of more blood groups. Blood group AB individuals have both A and B antigens on the surface of their RBCs, and their blood serum does not contain any antibodies against either A or B antigen. 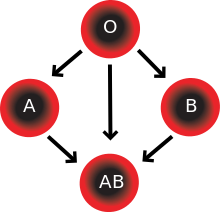 Therefore, a individual with type AB blood can receive blood from any group (with AB being preferable), but can only donate blood to another group AB individual. AB blood is also known as "universal receiver". Blood group A individuals have the A antigen on the surface of their RBCs, and blood serum containing IgM antibodies against the B antigen. Therefore, a group A individual can only receive blood from individuals of groups A or O (with A being preferable), and can donate blood to individuals of groups A or AB. Blood group B individuals have the B antigen on their surface of their RBCs, and blood serum containing IgM antibodies against the A antigen. Therefore, a group B individual can only receive blood from individuals of groups B or O (with B being preferable), and can donate blood to individuals of groups B or AB. Blood group O individuals do not have either A or B antigens on the surface of their RBCs, but their blood serum contains IgM antibodies against both A and B antigens. Therefore, a group O individual can only receive blood from a group O individual, but they can donate blood to individuals of any ABO blood group (ie A, B, O or AB). O blood is also known as "universal donor". Blood types are inherited and represent contributions from both parents. The ABO blood type is controlled by a single gene with three alleles: i, IA, and IB. The gene encodes an enzyme that modifies the carbohydrate content of the red blood cell antigens. IA and IB are dominant over i, so ii people have type O, IAIA or IAi have A, and IBIB or IBi have type B. IAIB people have both phenotypes because A and B are codominant, which means that type A and B parents can have an AB child. Thus, it is extremely unlikely for a type AB parent to have a type O child (it is not, however, direct proof of illegitimacy): the cis-AB phenotype has a single enzyme that creates both A and B antigens. The resulting red blood cells do not usually express A or B antigen at the same level that would be expected on common group A or B red blood cells, which can help solve the problem of an apparently genetically impossible blood group. Many people have the Rh Factor on the red blood cell. Rh carriers do not have the antibodies for the Rh Factor, but can make them if exposed to Rh. Most commonly Rh is seen when anti-Rh antibodies cross from the mothers placenta into the child before birth. The Rh Factor enters the child destroying the child's red blood cells. This is called Hemolytic Disease. Blood transfusions between donor and recipient of incompatible blood types can cause severe acute immunological reactions, hemolysis (RBCT destruction), renal failure, shock, and sometimes death. Antibodies can be highly active and can attack RBCs and bind components of the complement system to cause massive hemolysis of the transfused blood. A patient should ideally receive their own blood or type-specific blood products to minimize the chance of a transfusion reaction. If time allows, the risk will further be reduced by cross-matching blood, in addition to blood typing both recipient and donor. Cross-matching involves mixing a sample of the recipient's blood with a sample of the donor's blood and checking to see if the mixture agglutinates, or forms clumps. Blood bank technicians usually check for agglutination with a microscope, and if it occurs, that particular donor's blood cannot be transfused to that particular recipient. Blood transfusion is a potentially risky medical procedure and it is vital that all blood specimens are correctly identified, so in cross-matching labeling is standardized using a barcode system known as ISBT 128. When considering a plasma transfusion, keep in mind that plasma carries antibodies and no antigens. For example you can't give type O plasma to a type A, B or AB, because a person with type O blood has A and B antibodies and the recipient would have an immune response. On the other hand an AB donor could give plasma to anyone, since they have no antibodies. The table to the right is for plasma transfusions, and it's just the opposite for RBC transfusions. It doesn't take the Rh factor into effect, though, because most people don't have antibodies for the Rhesus factor (it only happens upon exposure). Often a pregnant woman carries a fetus with a different blood type to herself, and sometimes the mother forms antibodies against the red blood cells of the fetus, leading to low fetal blood counts, a condition known as hemolytic disease of the newborn. Hemolytic disease of the newborn, (also known as HDN) is an alloimmune condition that develops in a fetus when the IgG antibodies produced by the mother and passing through the placenta include ones which attack the red blood cells in the fetal circulation. The red cells are broken down and the fetus can develop reticulocytosis and anemia. The fetal disease ranges from mild to very severe and fetal death from heart failure - hydrops fetalis - can occur. When the disease is moderate or severe many erythroblasts are present in the fetal blood and so these forms of the disease can be called erythroblastosis fetalis. Before birth, options for treatment include intrauterine transfusion or early induction of labor when pulmonary maturity has been attained, fetal distress is present, or 35 to 37 weeks of gestation have passed. The mother may also undergo plasma exchange to reduce the circulating levels of antibody by as much as 75%. After birth, treatment depends on the severity of the condition, but could include temperature stabilization and monitoring, phototherapy, transfusion with compatible packed red blood, exchange transfusion with a blood type compatible with both the infant and the mother, sodium bicarbonate for correction of acidosis and/or assisted ventilation. Rh negative mothers who have had a pregnancy with or are pregnant with a Rh positive infant, are given Rh immune globulin (RhIG) also known as Rhogam, during pregnancy and after delivery to prevent sensitization to the D antigen. It works by binding any fetal red cells with the D antigen before the mother is able to produce an immune response and form anti-D IgG. A drawback to pre-partum administration of RhIG is that it causes a positive antibody screen when the mother is tested which is indistinguishable from immune reasons for antibody production. The most common inherited bleeding disorder, von Willebrand disease affects both men and women equally. Von Willebrand disease is similar to hemophilia in that it involves a definciency in the ability of blood to clot properly. Those affect by von Willebrand disease will have one or more of the following- low levels of von Willebrand factor (a protein that helps the blood to clot), and/or their von Willebrand factor doesn't work properly. While it is mostly an inherited disease (with factors contributed by both parents), von Willebrand disease may be an aquired syndrome in rare cases. There are three types of von Willebrand disease: Type 1, which is the mildest and most common form of the disease; Type 2, which has four subtypes (2A, 2B, 2M, and 2N) and ranges from mild to moderate in severity; and finally, Type 3, which is very rare and is the most severe form. In type 1 von Willebrand disease, there is a low level of von Willebrand factor. The level of factor VIII may also be lower than normal. This is the mildest and most common form of the disease. About 3 out of 4 people diagnosed with von Willebrand disease have type 1. In type 2 von Willebrand disease, a defect in von Willebrand factor causes it to not work properly. Type 2 is divided into 2A, 2B, 2M, and 2N. Each is treated differently, so knowing the exact type is important. People with type 1 and type 2 von Willebrand disease may have the following mild-to-moderate bleeding symptoms: easy bruising, nosebleeds, bleeding from the gums after a dental procedure, heavy menstrual bleeding in women, blood in their stools or urine (from bleeding in the intestines, stomach, kidneys or bladder), excessive bleeding after a cut or other accident or surgery. People with type 3 von Willebrand disease usually have no von Willebrand factor and very low factor VIII. Type 3 is severe and very rare. Symptoms of type 3 von Willebrand disease might include any of the symptoms of types 1 and 2, and also include severe bleeding episodes for no reason, which can be life threatening if not treated immediately. Bleeding into soft tissues or joints (hemarthrosis), causing severe pain and swelling, is another symptom. Many people with von Willebrand disease do not require treatment to manage the disease. However, if treatment is ncessary, it may include a range of different interventions depending on the severity. These involve medicine to increase the level of von Willebrand factor in the blood (DDAVP), medicine to prevent the breakdown of clots (called antifibrinolytic drugs), medicine to control heavy menstrual bleeding in women (often birth control pills), or injection of clotting factor concentrates (containing von Willebrand factor and factor VIII). Disseminated intravascular coagulation (DIC), also called consumptive coagulopathy, is a pathological process in the body where the blood starts to coagulate throughout the whole body. This depletes the body of its platelets and coagulation factors, and there is a paradoxically increased risk of hemorrhage. It occurs in critically ill patients, especially those with Gram-negative sepsis (particularly meningococcal sepsis) and acute promyelocytic leukemia. Hemophilia is a disease where there is low or no blood protein, causing an inability to produce blood clots. There are two types of Hemophilia: Type A, which is a deficiency in factor VIII and Type B, (Christmas disease) a deficiency on factor IX. Because people with hemophilia have an impaired ability to make blood clots, even a little cut may take hours or days to fully clot, and a small bump or jar to the body could cause severe bruising that doesn't heal for months. Internal muscle bleeds are the most common symptom though, causing swelling and varying degrees of pain. Hemophilia is passed down from mothers to their sons. Hemophilia is sometimes known as the "Royal Disease". This is because Queen Victoria, Queen of England (1837-1901), was a carrier of hemophilia. The hemophilia disease was passed down to her son Leopold who ended up dying at age 31. Queen Victoria also had two daughters who were carriers. These daughters passed hemophilia into the Spanish, German, and Russian royal families. One of the most famous stories is that of the Russian royal family. Alexandra, granddaughter to Queen Victoria, married Nicholas (Tsar of Russia in the 1900s). Alexandra was a carrier of the disease and passed the disease to their first son, Tsarevich Alexi, who was heir to the throne of Russia. The family tried to keep their son's secret from the people, but Alexi suffered with serious bruises and extreme pain. The family found help from a monk named Rasputin. He kept their secret and gained a great deal of power over the family, making them think he was their only hope. During this time of great turmoil in Russia, Nicholas and Alexandra spent most of their attentions on their son, and not on the people. It wasn't long before the Bolshevik Revolution of 1917 began. Anemia (AmE) or anaemia (BrE), from the Greek (Ἀναιμία) meaning "without blood", refers to a deficiency of red blood cells (RBCs) and/or hemoglobin. This results in a reduced ability of blood to transfer oxygen to the tissues, causing hypoxia. Since all human cells depend on oxygen for survival, varying degrees of anemia can have a wide range of clinical consequences. Hemoglobin (the oxygen-carrying protein in the red blood cells) has to be present to ensure adequate oxygenation of all body tissues and organs. The three main classes of anemia include excessive blood loss (acutely such as a hemorrhage or chronically through low-volume loss), excessive blood cell destruction (hemolysis) or deficient red blood cell production (ineffective hematopoiesis). In menstruating women, dietary iron deficiency is a common cause of deficient red blood cell production. Image of RBC's with Sickle Cell mutations. Sickle-cell disease is a general term for a group of genetic disorders caused by sickle hemoglobin (Hgb S or Hb S). In many forms of the disease, the red blood cells change shape upon deoxygenation because of polymerization of the abnormal sickle hemoglobin. This process damages the red blood cell membrane, and can cause the cells to become stuck in blood vessels. This deprives the downstream tissues of oxygen and causes ischemia and infarction. The disease is chronic and lifelong. Individuals are most often well, but their lives are punctuated by periodic painful attacks. In addition to periodic pain, there may be damage of internal organs, and/or stroke. Lifespan is often shortened with sufferers living to an average of 40 years. It is common in people from parts of the world where malaria is or was common, especially in sub-Saharan Africa or in descendants of those peoples. Genetics: Sickle-cell disease is inherited in the autosomal recessive pattern, depicted above. The allele responsible for sickle cell anemia is autosomal recessive. A person who receives the defective gene from both father and mother develops the disease; a person who receives one defective and one healthy allele remains healthy, but can pass on the disease and is known as a carrier. If two parents who are carriers have a child, there is a 1-in-4 chance of their child developing the illness and a 1-in-2 chance of their child just being a carrier. Polycythemia is a condition in which there is a net increase in the total circulating erythrocyte (red blood cell) mass of the body. There are several types of polycythemia. In primary polycythemia, there may be 8 to 9 million and occasionally 11 million erythrocytes per cubic millimeter of blood (a normal range for adults is 4-5 million), and the hematocrit may be as high as 70 to 80%. In addition, the total blood volume can increase to as much as twice as normal. The entire vascular system can become markedly engorged with blood, and circulation times for blood throughout the body can increase up to twice the normal value. The increased numbers of erythrocytes can increase of the viscosity of the blood to as much as five times normal. Capillaries can become plugged by the very viscous blood, and the flow of blood through the vessels tends to be extremely sluggish. As a consequence of the above, people with untreated Polycythemia are at a risk of various thrombotic events (deep venous thrombosis, pulmonary embolism), heart attack and stroke, and have a substantial risk of Budd-Chiari syndrome (hepatic vein thrombosis). The condition is considered chronic; no cure exists. Symptomatic treatment (see below) can normalize the blood count and most patients can live a normal life for years. Secondary polycythemia is caused by either appropriate or inappropriate increases in the production of erythropoietin that result in an increased production of erythrocytes. In secondary polycythemia, there may be 6 to 8 million and occasionally 9 million erythrocytes per cubic millimeter of blood. A type of secondary polycythemia in which the production of erythropoietin increases appropriately is called physiologic polycythemia. Physiologic polycythemia occurs in individuals living at high altitudes (4275 to 5200 meters), where oxygen availability is less than at sea level. Many athletes train at higher altitudes to take advantage of this effect — a legal form of blood doping. Actual polychthemia sufferers have been known to use their condition as an athletic advantage for greater stamina. Other causes of secondary polycythemia include smoking, renal or liver tumors, or heart or lung diseases that result in hypoxia. Endocrine abnormalities, prominently including pheochromocytoma and adrenal adenoma with Cushing's Syndrome, are also secondary causes. Athletes and bodybuilders who abuse anabolic steroids or erythropoietin may develop secondary polycythemia. Relative polycythemia is an apparent rise of the erythrocyte level in the blood; however, the underlying cause is reduced blood plasma. Relative polycythemia is often caused by fluid loss i.e. burns, dehydration and stress polycythemia. Leukemia is a cancer of the blood or bone marrow characterized by an abnormal proliferation of blood cells, usually white blood cells (leukocytes). It is part of the broad group of diseases called hematological neoplasms. Damage to the bone marrow, by way of displacing the normal marrow cells with increasing numbers of malignant cells, results in a lack of blood platelets, which are important in the blood clotting process. This means people with leukemia may become bruised, bleed excessively, or develop pin-prick bleeds (petechiae). White blood cells, which are involved in fighting pathogens, may be suppressed or dysfunctional, putting the patient at the risk of developing infections. The red blood cell deficiency leads to anaemia, which may cause dyspnea. All symptoms may also be attributable to other diseases; for diagnosis, blood tests and a bone marrow biopsy are required. Eosinophil: white blood cell that is involved in the immune response against parasitic worms (such as tapeworms and roundworms). Named because it stains with the red dye "eosin." Factor V Leiden most common genetic hypercoagulability disorder. Monocytes: The largest white blood cell. Becomes a macrophage when activated. Engulfs pathogens and debris through phagocytosis, also involved in presenting antigens to B and T lymphocytes. 3. Fred's blood type is O- and Ginger's is B+. Fred and Ginger have a son who is AB+. What do you conclude? 4. Which blood component plays the largest role in maintaining the osmotic pressure of blood? 9. In a normal blood sample, which of the following cells will be the most abundant? 11. What is the primary function of bood? 12. What is the main component of the Red blood cell? This page was last edited on 28 March 2018, at 22:58.